1961 Landrover Fire Armour Firefly ex Dowty Rotol Gloucester 8500miles from new with full equipment as supplied by Fire Armour Ltd. Interesting contrast across the Ocean. Added by Rob Johnson on 01 June 2018. And I'm betting the Land Rover is still capable of outperformrming the GMC in every notable department. Apart from speed obviously! Added by Yelp Bullhorn on 04 June 2018. If you include payload and accommodations, you lose! Added by Rob Johnson on 05 June 2018. Sorry, Rob, I deliberately chose not to consider those attributes: I was thinking of the vehicles' requirements for the day they represent, so didn't feel it fair to factor in those obvious differences. But you could load the Lanny up with kit towering twenty-feet into the air and have firefighters hanging off every available inch of thick steel plate, and it'd still trundle-on seemingly unaffected! And while towing the GMC up a muddy hill, I'm betting!!! Awesome vehicles Land Rovers, if not a tad annoying and uncomfortable to drive, even the new ones! Rob, the GMC might possibly trump the Land Rover on turning circle too!?!? I've driven many Land Rovers and have been required to perorm three-point turns on the the most innocuous of bends and turns. So frustrating. But then again the GMC looks quite long and awkward, but it does have much bigger wheel arches to allow its big knobbly tyres to turn. Added by Yelp Bullhorn on 06 June 2018. 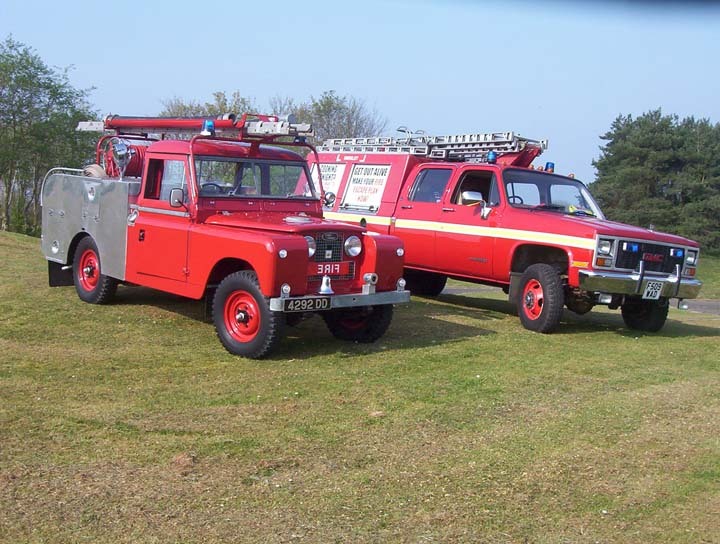 As you may have noticed from some of my other comments about Land Rovers, I have something of a "bee in my bonnet" about how frequently many fire brigades have overloaded these vehicles with all kinds of unsafe modifications. There are loads of examples just on this site; it is not limited to Land Rovers, unfortunately, but they do seem to be very common. As you mention, they are not that easy to drive quickly anyway, especially off road, but when they are overloaded, top heavy, and/or towing trailers the idea that they are there to save lives turns into a paradox. There are no stats that I know about, but I can only imagine they have a higher accident and injury rate than any other types of fire appliances. This is not to say the Land Rover itself is to blame. These problems must be laid at the door of the brigades themselves, and the body builders who create these unsafe modifications.